Accelerator facilities are filled with long, underground tunnels that houses large machine components, beam pipes, powerful magnets and walkways. Such locations must comply with IEC 60598-2-22 on Standard for Luminaires for Emergency Lighting. The regulation requires emergency fixtures not exceeding 1,000 volts to function in emergency mode for half of its rated duration (minimum) in ambient temperatures of 70 degrees Celsius. Accelerator facilities are filled with long, underground tunnels that houses large machine components, beam pipes, powerful magnets and walkways. Such locations must comply with IEC 60598-2-22 on Standard for Luminaires for Emergency Lighting. The regulation requires emergency fixtures not exceeding 1,000 volts to function in emergency mode for half of its rated duration (minimum) in ambient temperatures of 70 degrees Celsius. Additionally, luminous flux levels must not dip below 50 percent during emergency mode operation. Luminaries used inside accelerator environments should also be able to withstand high levels of radiation in order to remain operational. This article provides recommendations for light-emitting diode (LED) lighting systems in particle accelerator facilities. In the past, accelerator facilities deployed low-pressure sodium (LPS) and incandescent lighting systems for illumination. Such practices date back to legacy accelerator systems, such as the Super Proton Synchrotron and Large Electron Positron Collider. Today, the outdated luminaries are being replaced by more efficient lighting options, such as LEDs. Moreover, new lighting regulations (set forth by the EU Commission and US Government) are discouraging the use of poor performing lamps, including T8 halo phosphate fluorescent tubes (2010), E27/E40/PGZ12 metal halide lamps and E27/ E40/ PGZ12 high-pressure sodium (HPS) lights. In most cases, the direct solution to compliance involves updating outdated lighting systems with LEDs. By comparison, LEDs offer a lengthy lifespan of 50,000+ hours, which is unmatchable by other lighting technologies (metal halide: 20,000+ hours; incandescent: 1,200+ hours and compact fluorescents [CFLs]: 8,000 hours). This is a huge advantage for hazardous nuclear and accelerator facilities, as the utilization of LEDs can decrease re-lamping and maintenance. LEDs also offer up to 70 percent in energy savings and instant-on/toggling features (no warm-up required). During illumination, the fixtures do not use toxic substances, which can improve safety in the facility during accidents, explosions or breakage. LPS fixtures contain sodium metal and mercury (also found inside metal halide and fluorescent luminaries) – a volatile material, according to the US EPA. At the end of their lifecycle, such lights must be carefully handled and disposed according to HAZMAT guidelines. 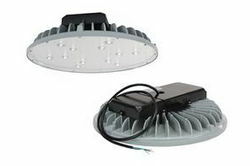 Traditionally, most commercial LED luminaries incorporate Switch Mode Power Supply (SMPS), i.e., buck, boost and flyback converters, designs for illumination. In industrial environments, SMPS converts a standard source voltage to a specific output voltage. This is a popular solution for reliable and efficient DC-DC power conversion. When deployed in locations with high levels of radiation, the main issue with using SMPS is tolerance. Simply put, exposing an LED light leveraging SMPS technology to an accelerator radiation environment will lead to premature failure – in some cases, within five minutes of exposure. According to a CERN report titled Radiation Hardening of LED Luminaires for Accelerator Tunnels (authored by J. D. Devine, and A. Floriduz), a solution to this concern includes the utilization of modified power supply units with diode bridge rectifier components. To support their findings, scientists tested diode bridge rectifier designs in accelerator radiation environments, against traditional power supply units. The first group was composed of three LED lights with a transformer and W08M diode bridge rectifier power supply; while the second group was comprised of three LED luminaries with SMPS converters. Both groups were exposed to radiation in four doses with cumulative TID of 9, 47.9, 93.7 and 129.3 Gy. During irradiation, the second group that utilized traditional SMPS failed prematurely after one hour, four hours and 18 hours of exposure with corresponding Total Integrated Dose (TID) values of less than 0.1 Gy, 0.1 Gy and 0.4 Gy respectively. The scientists uncovered that the reason of premature failure stemmed from damaged “power switches of the high frequency DC/DC converter, on the PWM control circuitry and on opto-couplers.” By comparison, the first group equipped with diode bridge rectifiers completed all of the tests without displaying any signs of housing or illuminance degradation. Impressively, “the total dose reached was of 129 Gy, at a HEH fluence of 7.0 • 1011 cm-2 and 1 MeV neq fluence of 1.0 • 1012 cm-2.” It is important to consider that 129 Gy is equivalent to 12,900 RAD. In accelerator radiation environments, LED luminaries must incorporate components that are resistant to radiation. These materials should be able to withstand specific levels of radiation, to ensure functionality. Traditionally, LED lighting systems use PMMA plastic or polycarbonate materials to reinforce the physical properties of lenses. For accelerator radiation environments, this is not possible, as high doses of radiation will cause the materials to turn brown or amber (e.g., exposing clear glass to a Cobalt-60 radioactive isotope source will cause discoloration). This type of damage results in reduced light transmission, which could affect the luminary’s illuminative properties. According to a 2012 study titled The effect of neutron and mixed gamma and neutron irradiation on the solar properties of borosilicate glass (authored by N. Baydogan and A.B. Tugrul), borosilicate glass is the lens material of choice for fixtures in accelerator facilities. The material supports a low coefficient of thermal expansion (at room temperature). It is also highly resistant to thermal shock. In application, borosilicate glass is utilized to manufacture radiation barriers and thermal insulation products for space-related projects. In nuclear facilities, hot cell windows may incorporate borosilicate glass due to its high neutron filter performance. Furthermore, it would also be possible to use to high purity fused silica (quartz) to reinforce LED luminaries for accelerators. In application, this material was highlighted in patent US 5668067 A (US 08/697,094) “High purity fused silica having high resistance to optical damage.” When used as a lens, it offers high radiation resistance, light transparency (UV to infrared), chemical purity and thermal resistance; while providing low thermal expansion. It is important to consider that there are four classifications of fused quartz materials for lighting systems: Type 214, Type 219, Type 254 and Type 021.